ETC Institute staff has successfully geocoded survey results for dozens of market research projects in the past three years. Our GIS team can bring highly developed and current skills in automated information collection, data cleanup and manipulation, state-of-the-art geocoding, and database development. Our planners and technicians routinely support transportation planning, customer satisfaction analysis, parks and recreation planning, and other planning and modeling efforts around the country. 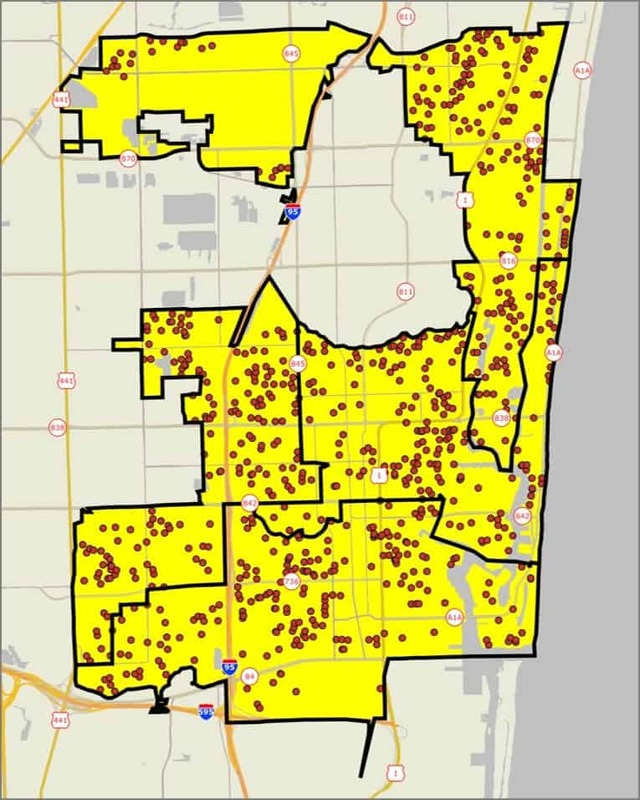 The map below shows the physical distribution of respondents from a survey conducted for Fort Lauderdale, Florida in 2015. The dots show the location of respondents based upon geocoded latitude and longitude coordinates of their home address. GIS maps not only provide our clients with a visual representation of the areas of the City that are surveyed, but they also show areas where residents have the greatest and least amount of satisfaction with various services. The map below shows levels of satisfaction with the overall value of soccer fields in Fort Lauderdale, Florida. Areas in blue identify areas with high levels of satisfaction. Areas in orange and red identify areas with lower levels of satisfaction. The map shows that residents living in the general central area of Fort Lauderdale feel more satisfied with the quality of soccer fields than those in the south eastern part of the City. Our GIS technicians have developed an exceptional working relationship that benefits our clients. This technology has helped to improve data reliability and gives our team the ability to deliver a top quality product on time and on budget. At ETC Institute, we accurately geocode (provide latitude and longitude) lists of addresses, intersections, place names, tourist attractions, transit stops, and almost any other location records anywhere in the U.S. with very high match rates. Our record “hit” rates are well above the industry average thanks to our well-thought-out, systematic, and rigorous record quality assurance process (REQAP), which begins at the survey design stage and continues until the last record has been geocoded and verified.